There’s lots of theories as to why it happened, some sensible and some way, way out there. Here on the Homestead, we’re pretty sure it didn’t have anything to do with aliens while acknowledging the very plausible argument that NASA had a finger in the pie. 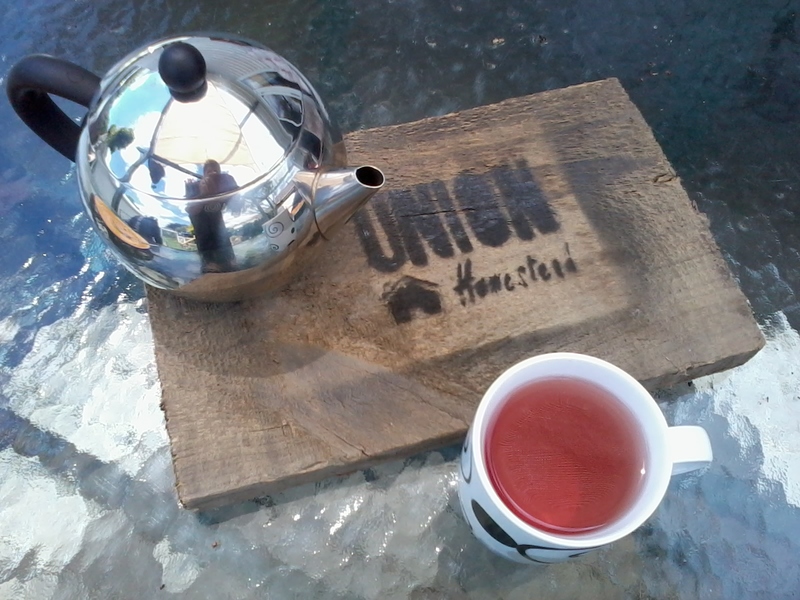 Whether it comes down to being too time-hungry, too revolting, or just downright archaic, somewhere along the way the practice of making your own stock/bouillon plummeted into that weird twilight-zone abyss we explored in Homestead Kitchen –Essence. In short, it became one of those unfathomably produced, mined, or concocted ingredients well beyond the abilities of the humble home cook. Therefore, in “The Olden Days” (as Farm Girl likes to call any time prior to the year 2000) that elusive rich, full, oomph-packed flavouring was purchased in powder form (dehydrated, added salt, added fat, added “flavour”, stabilized, and emulsified) or compressed into little individually foiled cubes. In fact, as it’s usual storage place in the pantries of the senior Homesteader’s youth was alongside the cinnamon, mixed spice, mixed herbs and mustard powder, it took a while for these fledgling home makers to work out that it wasn’t just another exotic spice. This misconception wasn’t helped by the cookbooks available at the time to this wet-behind-the-ears duo; even the soup recipes starting with boiling ham hocks in vats of water for several hours called for the lobbing in of a hearty helping of the magic/Maggi dust. Somehow, while poor old salt was shunned, languishing on the verboten list with eggs and butter, stock powders were able to surf the culinary wave, cleverly changing tack whenever a wipeout threatened. Even Oma’s Brown Bean Soup called for the things! None in this bowl of deliciousness though. Straight from the lab! Cutting edge science! A culinary breakthrough! Low fat, low salt stock. As little Homesteaders began to appear and the labelling of ingredients became law in New Zealand and Australia, we became a shade more aware of just what we and our precious tots (sigh…they were soooo cute) were ingesting buried in our hearty, homemade soups, stews and casseroles. This enlightenment spawned a period of relatively tasteless meals, if we’re being honest. Tomato puree was rather over employed as a reliable, relatively unmitigated taste enhancer and we learnt an invaluable amount about herbs and spices, but at the end of a wet, miserable day when you’re all fighting a bit of a sniffle you can’t beat a bowl of good ol’ chicken soup. Cue: Homestead Hero, Hugh. Not a whisper of manufactured flavour and the most wonderful soundbite from Tony at 1’58 to snigger at. So we started stockpiling…ahem…stock. Generally, we stow the leftovers from roast dinners, celery ends, parsnip tops, mushroom stalks and the like in dedicated “stock bags” in the freezer (note: the chocolate muffin bag now no longer resembles the bacon rind one; you only make that mistake once) . Then, when weather conditions dictate the daytime ignition of the woodburner, out comes the mega-pot, selected bags are upended and covered with water and, hubble bubble, the cauldron is left to do its thing. We like to leave it overnight to cool into a gloopy, jellied mess, then reheat it to boiling in the morning. Straining, cooling and then skimming off the excess fat (which obligingly sits in a solidish mass on the cooled surface) wrings every last little bit of goodness out of the core ingredients. 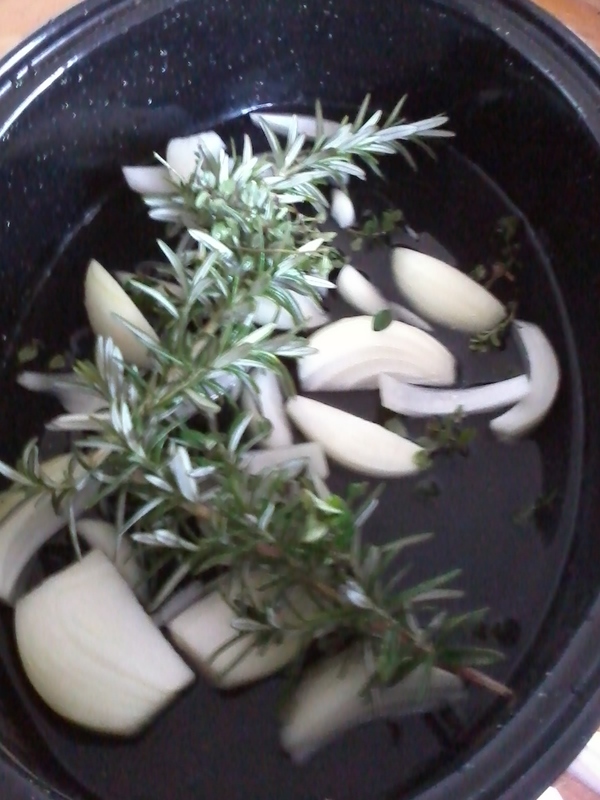 A snuggly, yumptious bed of onion and rosemary for our pork bones to nestle up to in the oven. Sometime we go all out and throw some bones into the oven with the express intention of making stock. Okay, we may pour over a garlic, honey, soy sauce, mustard concoction in the final half hour or so of cooking, boil up a pot of floury spuds, steam some greens and smoosh it all together to enjoy before consigning the bones to the respective freezer bag (maybe we shouldn’t have shared that) or we might do as we did this time and genteelly pick the meat from the bones á la the hugely fashionable pulled pork. It just depends how stone age (cheers Tony) we’re feeling. We strain through a steamer. Clear stock isn’t our aim and it lets in little bits of goodness while keeping out the tooth-breaking bones. 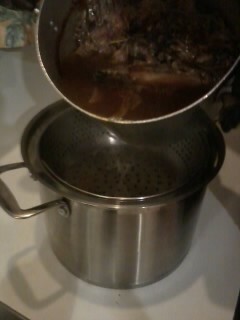 The species supplying the meaty goodness dictates the final resting place of the boiled remains. They’re either fed to the hugely appreciative chickens or, in the case of the flavouring coming courtesy of one of their brethren, consigned to the depths of the lidded, turbocharged worm farm for disposal. The resultant liquid lusciousness (we’re talking stock here, not worm farm ooze) is either frozen in old honey containers (approximately 400 ml lots) for future gravy, stews, casseroles, pasta dishes etc or we add prettily cut up vegetables along with the mandatory handful of finely chopped parsley to make the yearned for soup. We always taste before serving and usually end up adding a pinch or two of salt. Yep, we know: it’s verboten. But at least we know what it is because we put it in and, besides, here on the Homestead we like living life on the edge…of the Stone Age. This entry was posted in Homestead Kitchen and tagged casserole, Chicken, chicken stock, cook, cooking, eating, Food, foodies, home cooking, homemade, homemaking, ingredients, leftovers, meal, meals, recipe, recipes, soup, stock. Bookmark the permalink. Love the video clip of Hugh (I’m a fan too), and Tony right at the end – who, sadly, is all too right. Your idea of bagging all the leftovers is brilliant, though I can see that with my level of organization, mistaking bacon rind for chocolate muffin would be all too likely. I had to empty a freezer recently (we have 4), and there was a box that hubby and I puzzled over…what were these things? Just how old were they? I wasn’t raised with home made soup, only soup out of a can, because my Mum wasn’t fond of soup. Hubby was raised with hearty, brothy, made from scratch soups. There was some learning on my part when we got married. 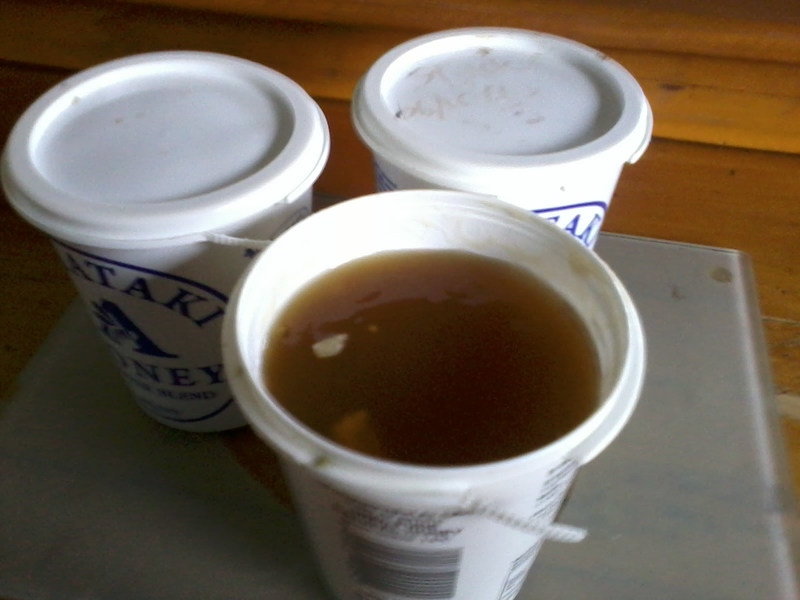 Making stock and freezing it (warning, chicken stock and apple sauce look very similar in unlabeled tubs, but they do very different things in a recipe) is an ongoing process year round. When I get a pig butchered, I ask for the bones. 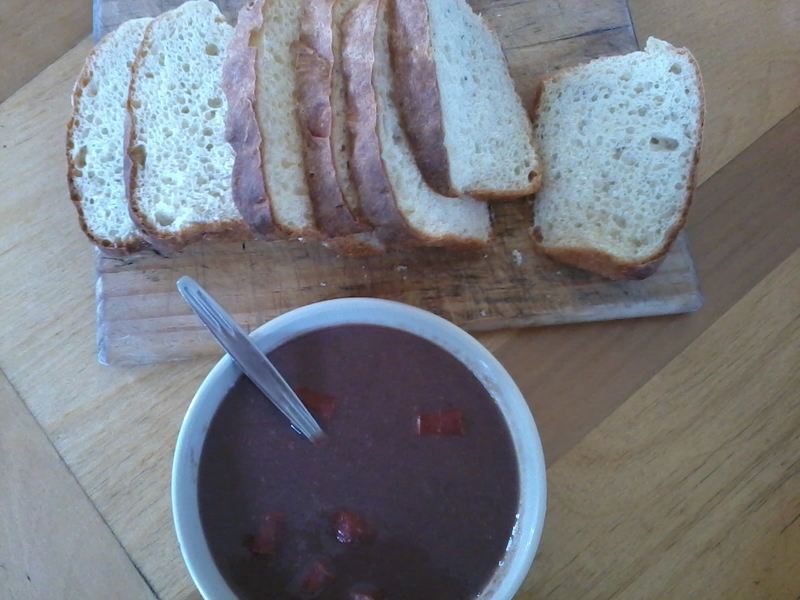 I now love home made soup, not just for the budget eking that Hugh demonstrates, though that’s a part of it, but simply because it’s such good stuff. My only problem is that one of my offspring turned vegetarian about a year ago (about a week before the first pigs were butchered, what suspicious timing). I have served a lot less soup this year, stymied by this inability to use my huge supply of stock, chicken carcasses, etc. I can make a veggie stock, but it frankly doesn’t taste as rich, and the thought of making two soups is just…well…too much work. I sense you may be in the same league as me when it comes to food storage. Invariably I think, “of course I’ll remember this is…” only to be left, on that fateful freezer cleaning day, with a collection of “well, it could be apple, could be stock, or maybe it’s …oh! Pork dripping; I remember now.” Makes life interesting, I guess. Apple sauce?! It’s the chameleon of the frozen world…it looks like everything and everything, when frozen, ends up looking like it. Eek to vegetarian offspring! And vegetarian stock? Not worth the effort, I reckon. As always, thanks for taking the time to comment. They always bring a smile to my day. Great Post, great tips and we share the love for Riverside Cottage! Your writing is wonderful….